The Los Angeles Theatre on Broadway and Sixth Street in downtown Los Angeles is especially hot, sweaty and crowded. Today this sumptuous art deco palace built by Charlie Chaplin in 1931 is the location for an episode of TV show Scandal and rehearsals for the camp musical Carrie – The Killer Musical Experience. Chaplin, whose photograph with Albert Einstein adorns the gilded lobby, would be proud that, despite the lack of air conditioning and the crumbling plaster walls, his dream is still alive. His links with ETC reach back into corporate prehistory. “I first worked with Fred Foster while he was contracted to build products for Berkey Colortran, designing a control system for Epcot on Parade,” says Gale, “and I was one of the first to use the ETC Concept desks designed for Disneyland in 1982.” After ETC acquired LMI and got into the dimmer business, Gale was one of the company’s early corporate clients. “I ordered 10 or 12 dimmer racks for the Pleasure Island attraction in Florida, and Fred was my install technician,” chuckles Gale. In a great slice of ETC history, he is proud that he convinced Fred to write a Macintosh interface, so that a club DJ could run his cues on HyperCard. “I am not sure Fred has forgiven me for that,” he jokes. His current project, Carrie – The Killer Musical Experience, looks like an ETC fixture catalogue. “I have equal numbers of Source Four® LED Series 1 and 2 Lustrs, Selador® Desires and Classics – my keylight is 60 tungsten Source Fours with a lot of 26-degree lenses. The LED Series 2 Lustr makes a perfect downlight, and of course the whole rig runs on Eos Ti,” says Gale. Gale gets excited about the Stagecraft Institute of Las Vegas, which he describes as a ‘total immersion experience’ for students. 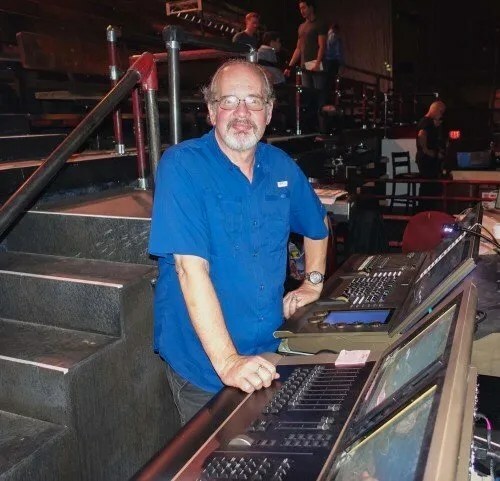 The Institute, backed by manufacturers’ donated equipment, gives students the chance to program and run massive lighting systems in simulated show conditions. “We teach everything you can’t learn in college or theatre school,” describes Gale. “It’s all hands on. They get straight into rigging, patching, focusing and running a complex console.” The students – in between college and professional theatre – learn on multiple platforms, using Eos Ti® and GrandMA consoles to run a 300-instrument lighting rig with Selador Desire Lustr® and Vivid, and assorted moving lights. Gale remembers the introduction of the Source Four as a ‘game changer.’ Ever the innovator, he has hopes and suggestions for the next generation of fixtures. “There was an English fixture I came across that had both hard and soft shutters. I would love to see a Source Four like that,” says Gale, whose ideas often filter up to the top levels of ETC’s development team. As an Eos Ti power user, he would also welcome a ‘fixture profile by cue’ feature, allowing the user to alter the curve of a fixture for each cue. It would be easy to characterise Gale as a technophile, but that would entirely miss the point. He freely shares his design philosophy: “My students worry about keeping up with technology, and I tell them to concentrate on bringing narrative and storytelling to their work and to use technology that matches that vision.” He also advocates a minimalist approach in contrast to an increasing overuse of video and effects in what he calls the ‘uncurated’ lighting design style: “I encourage them to look at shows with a critical eye and let me know if they see a design that doesn’t give it all away in the first 10 minutes.” Now that’s a challenge we should all take up!